Smoking can increase your risk of many serious eye diseases. Fortunately, you can lower your risk of vision loss and other eye health issues by quitting smoking as soon as possible. 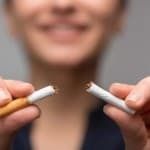 In this post, the team of board-certified ophthalmologists at Austin Eye discusses why smoking is dangerous to your eye health. Macular degeneration can cause blind spots in your central vision — the vision you use to see straight ahead. Your risk of macular degeneration increases as you age, but smoking is also a major risk factor. Not only does smoking increase your risk of developing this eye disease, but living with a smoker can also make it more likely that you will experience macular degeneration. Smokers are also more likely to form cataracts than non-smokers. A cataract is a clouding of the lens of the eye. If you are a heavy smoker, you may have an even higher risk of developing cataracts. Chronic dry eye is a painful and irritating condition. While most people occasionally experience dry eyes, people with chronic dry eye have persistent dry eyes that negatively impact their quality of life. Smokers are more likely to experience dry eye, and second-hand smoke is a potential eye irritant for the people you smoke around. Smoking increases your risk of many health problems throughout the body. Your eye health is connected to your overall health, so you may develop health problems that are risk factors for various eye diseases. For example, smoking increases your risk of diabetes. This makes it more likely you will suffer from diabetic retinopathy, which occurs when the blood vessels in the eye are damaged. Smoking also increases your risk of high blood pressure, which in turn can increase your risk for glaucoma. You can reduce your risk for all of these vision problems by quitting smoking. You should also visit your ophthalmologist regularly to detect any problems early on before they become more difficult to treat. Schedule your next eye exam with one of our board-certified ophthalmologists by calling our North Office at (512) 250-2020 or calling our Central office at (512) 454-2020.